The annual Rehoboth Tour has gone through many iterations over the decades. This year was no exception as the tour ran Sunday through Tuesday, starting from Odessa. A total of 16 people enjoyed excellent early fall weather, about 220 miles of quite roads, favorable winds and fine dining. 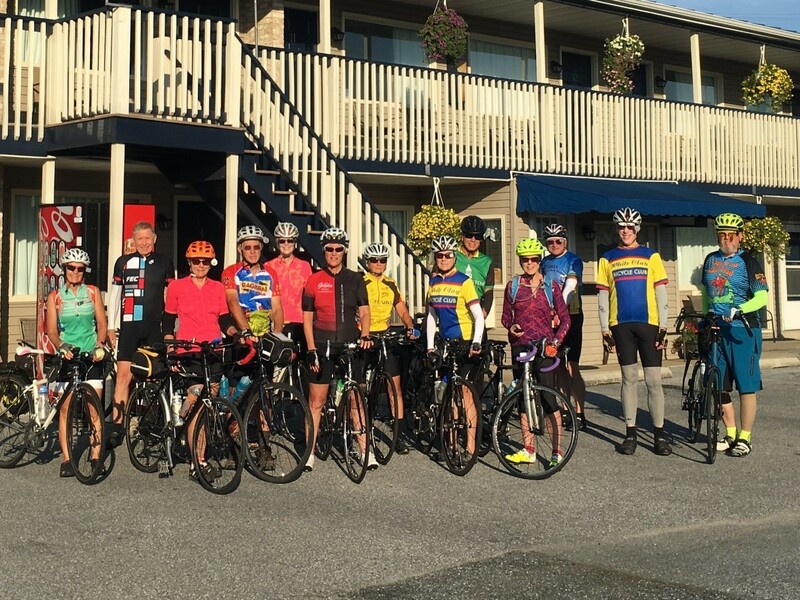 Shown below is the group leaving the Pirates Cove Motel in Rehoboth, on Monday morning, for a 56 mile loop from Rehoboth-Bethany-Dagsboro-Millsboro-Lewes (left to right: Mary Clare Matsumoto; Jeff Kraft; Deb Chaga; Alex Moeller; Mary Huis; Jan Johnson; Helen Boyle; Ceci McCormick; Rob King; Sally Butner; Greg Wood; John McCormick; Charlie Johnston – not shown Angela Suchanic; Nancy Waddell; Herman Kline). The ride was capped off by lunch at the Wheelhouse Restaurant and a ride though Cape Henlopen State Park on the scenic Gordon Pond Trail. It was a great tour, and we’re looking forward to continuing the tradition again next year. ← Message From the President – Wanna Be Savage?